Let`s take a look at some numbers. First, let’s look at impressions. Impressions are the number of times a person sees your advert or product. If we compare the cost of Google Adwords impressions and t-shirts, then sure, Adwords impressions look cheap to begin with, but let’s see what you actually get for your money. Your Adwords campaign is gone as soon as your customer clicks away, and they probably never properly took in your message anyway. Compare that to a t-shirt, where you get a tangible promotional resource that can be used for months, if not years. Let’s also drill down a bit deeper into impressions and see what those figures really mean. In 2008 a survey was conducted in New York, asking business people about the effectiveness of various promotional items such as t-shirts, mugs and caps. The study shows that a whopping 84% of people remember the name of the company of the branded item they received. Also, as you can see in the chart below, a t-shirt generates 365 impressions per month. 75% of the respondents kept the branded item for at least 7 months. This means that every single t-shirt generated 2555 impressions on average. According to Forrester, the online ad average cost per 1000 impressions for 2017 will rise to $4.68. This means that the cost for 2555 impressions is about $11.93. 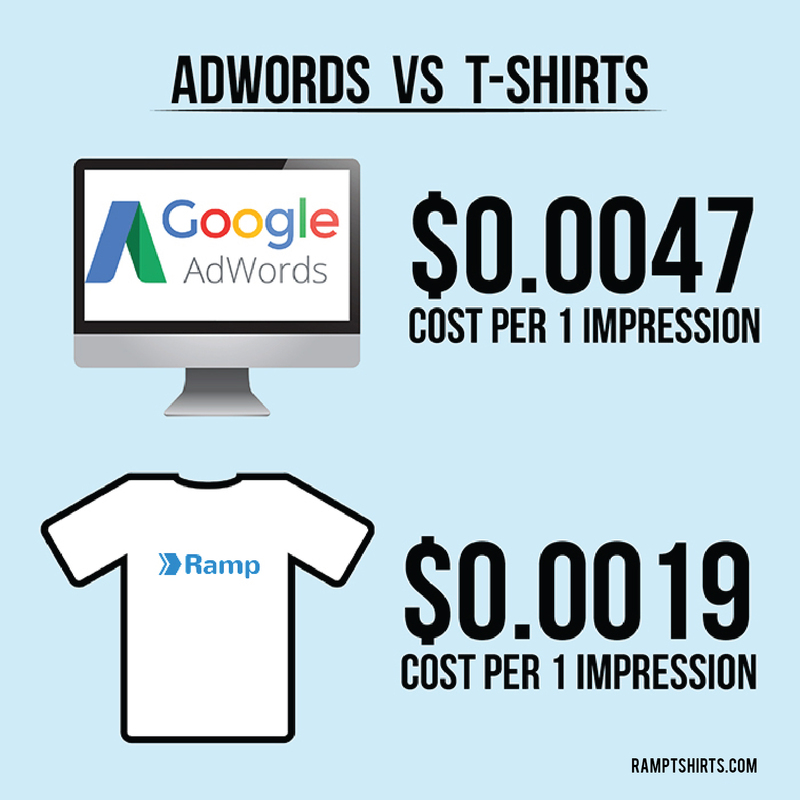 Compare that to t-shirts, with a run of 100 one-colour t-shirts costing around $5 each, and it’s clear where the value is – t-shirts are twice as effective as Adwords. So that’s impressions taken care of. What about conversion costs? 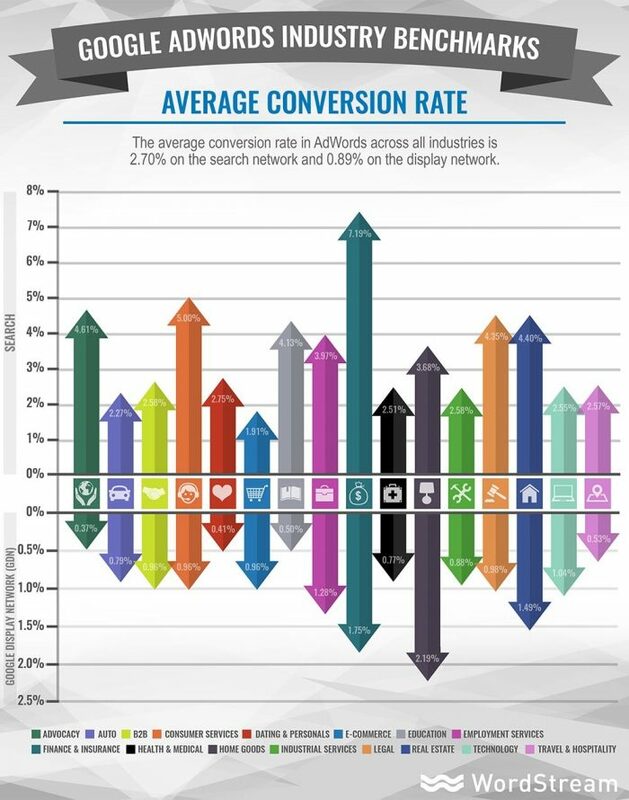 According to statistics from WordStream, the average Adwords conversion rate for 2016 is 2.70%. In 2012 the average rate was 5.63%. So, paid internet advertising is not constant and has its flaws. If Google tweaks an algorithm, your costs can change overnight. So, it’s wise to look for other types of advertising to spread your risk. Now one more stat – Cost Per Click. The average cost per click for 2016 is $2.32. If you’re ordering around 500 t-shirts, the costs per shirt are really similar. But let’s compare what you get – one lousy click (and let’s not even get into bounce rates which will further increase that CPC) versus a tangible item, which has the potential to generate much more business for you in future. That’s not all – let’s go back to that 2008 Survey. 42% of the respondents showed increased positivity in the perception of their brand and 24% were a lot more inclined to do business with the given company. What can you take away from this? Well clearly we make t-shirts, so we’re a little bit biased. But what is really clear is that relying on a single advertising channel isn’t a good idea, and a well-made branded t-shirt is another great tool in your marketing strategy. 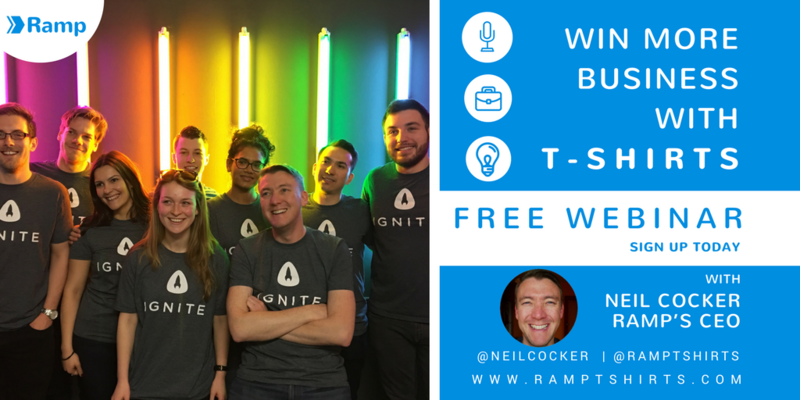 How do you feel about that t-shirt you got given by that startup two years ago? Still remember it? Now, can you remember any Adwords you saw just yesterday? Exactly…..
Ready to order your own customised t-shirts? Go here and get it done in under 3 minutes. Previous Previous post: The best t-shirts from SXSW – inspiration for 2017! Next Next post: What is Screen Printing?